Anise Catering is proud to team up with our latest venue, The Pilgrim’s Rest! 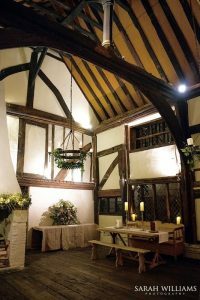 The Pilgrim’s Rest is a stunning Wealden Hall house nestled adjacent to Battle Abbey. 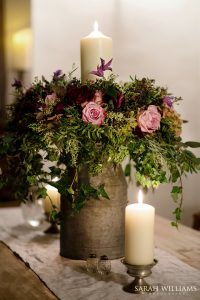 Built nearly 600 years ago, The Pilgrim’s Rest is an exclusive-use rustic venue located right in the heart of East Sussex. All three reception rooms – the Great Hall, the Dining Room and the Webster Room – have endless original features from ancient beams, inglenook fireplaces in every room to the crown post and linen fold doors. There is even a secret tunnel hidden under the Great Hall fireplace that runs beneath the Abbey walls. And let’s not forget the witch’s marks to ward off evil spirits! Having opened her doors to visitors and pilgrims to Battle since C1420, this grand old lady has seen some action! She has hosted celebrations from medieval banquets to Georgian balls, Victorian luncheons to Edwardian tea dances and now, in 2017 you can tie the knot there against this amazing backdrop of history. Over the centuries, flagons of ale, goblets of wine, flutes of champagne and copious cups of tea have been consumed beneath her eaves to the sounds of ladies’ chattering and gentlemen’s laughter. Pilgrim’s Rest is perfect for weddings, parties and celebrations all year around. And when the sun is shining, guests can enjoy an aperitif in the walled herb garden before dinner or they can enjoy meandering out into the beautifully tended rose garden between courses.